Following an axe attack on a Bavarian commuter train on Monday (18 July) by an Afghan refugee claiming allegiance to ISIS, Germany’s news media were awash with reports that the terrorist organisation had scored its first success in the country. euractiv.com news editor Joel Schalit was almost there. Joel Schalit is News Editor of euractiv.com, and comments on European affairs for Israel’s i24news. This article is excerpted from his forthcoming collection, Everywhere But There: Essays on Europe’s Diversity Crisis. His most recent book is Israel vs. Utopia. If it weren’t for my partner, I might be dead. Surely, every married person is wont to say such a thing, at one point or another. But, the expression is usually more of a cliche, than it is about reality. In my case, it was her persuading me to stay home, instead of attending the art opening of an Israeli friend, in Würzburg. We had a visa renewal appointment in Berlin to attend the following morning. It would have been too much to travel to Bavaria and back the same day. Had I gone, I may very well have ended up on the same train in which Riaz Khan Ahmadzai, a 17-year-old Afghan refugee wounded five tourists from Hong Kong with an axe, before being shot dead by cops. The attack took place at the same time I would have set out for Frankfurt, to catch a flight back home. One of the reasons we moved to Germany is for its stability. My wife had work waiting for her, the cost of living is low, and we’d be part of an expat community, with whom we have a lot in common. The fact that it is not as violent as Israel, or the US, was a relief, as an Israeli-American couple. Fifteen years since the start of the War on Terror, Germany remains spared from the terrorist attacks which have hit every other country allied with the US in the conflict. Britain, France, Spain, Belgium, even Denmark has been hit. But Germany, thankfully, hasn’t despite its involvement. Still, after every such attack in Europe, my wife and I wonder when such an event will take place in Berlin. Residents of a heavily Palestinian and Turkish neighbourhood, though extremely leftwing (PFLP, PKK and TKP/ML stickers are quite common), you can’t help but speculate. 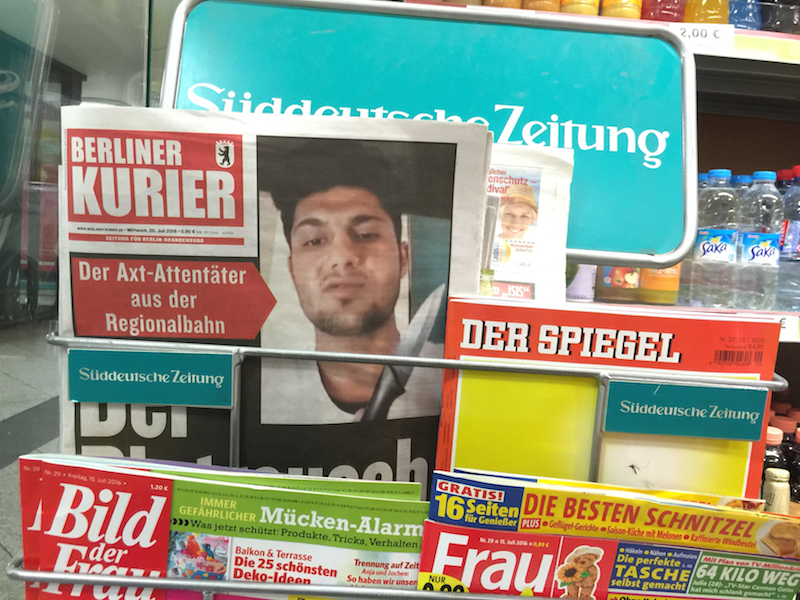 Syrian refugees are as commonplace in Neukölln as French and British tourists, and the daily newspaper adverts at the local spatis (night shops) are almost always for right-wing tabloids, frequently featuring stories about militant Islam, or impending jihadist attacks on Germany. As culturally familiar as it is to live amongst other Middle Easterners, the combination of signifiers is enough to make you nervous. Still, the Würzburg attack, ironically, was by no means a confirmation of our fears. Its scale, distance, and isolated nature made it feel far less serious than what German tabloids repeatedly forecast. Particularly when viewed in light of the level of killing that has taken place in France, and Belgium, over the last eighteen months, in which over three hundred lives have been taken, and nearly seven hundred injured. In such a context, Berlin feels like an oasis, in comparison to Brussels. That is not to downplay the attack’s ideological significance. Despite ISIS claiming the teen as a soldier, more evidence, according to reports, points to self-radicalisation, than it does his having been dispatched to Germany, under the cover of refugee status, to commit acts of terror. Without a doubt, the phenomenon of self-radicalisation is, of course, frightening, and should be taken seriously. But, it’s a lot deeper and more complex to make sense of than the sort of tabloid treatment it has been getting in the European press as of late, particularly after the Nice attack. German periodicals have been particularly preoccupied with the idea, as it is one that has been repeatedly championed by populist critics of immigration, as a possibility too dangerous to avail the country to. Why take the risk, especially with followers of a faith that allegedly preaches violence? Self-radicalisation is an idea that is unfortunately here to stay. But, rather than be made fearful by the anxiety it inspires, it would be more productive to break it down and see what it really refers to, dispensing with allusions to cultism, ‘greenwashing’ (sudden Islamic conversion) and the like. At its core, self-radicalisation refers to an inability to cope with the trauma that many refugees carry with them to Europe. Murder, torture, homelessness, impoverishment – every conceivable wound imaginable, consistently received across a vast geography, from Pakistan all the way to Syria. The psychological damage the refugees are bringing with them is comparable to that of Holocaust survivors, and survivors of aerial bombardments of Europe’s cities during WWII. Perhaps even more so, given the duration of the conflict, which is now over three times as long as the war. For Europeans, there is an unmistakable familiarity to what they see in refugees, bringing back memories, and conflicts, which make 1989, if not 1945, seem like yesterday. This is the dilemma facing Germans who on the one hand welcomed them in 2015, but now regret having done so. That doesn’t mean that the assaults in Cologne, on New Year’s Eve, weren’t real, or that the Afghan axe attacker, is somehow innocent. But what it does signify is the baggage many Germans bring to the refugee crisis helps prevents them from understanding what such events really mean. That’s why Germans must be careful not to fear refugees so much for being potential terrorists, but instead, persons whom, if not taken care of properly, will become a different kind of burden. Being subject to violence is one of the risks that’s assumed in dealing with anyone with war experience. Inevitably, someone will try and take advantage of these situations, and apply an ideological overlay which suits their purpose. Whether that comes via the ISIS news agency, Dabiq, or Islamophobic politicians from Alternative für Deutschland, the situation remains the same. Of course, my partner could not forecast what would happen on Monday night. But words fail when I try to explain how much I appreciate her request in retrospect. For a Jewish family like ours, living in Germany, it has a resonance all its own. It’s a disaster just waiting to happen and bound to get a whole lot worse. Things are unravelling faster than they can stick them back together. There needs to be big changes and this whole philosophy of an open Europe needs to get thrown out. I agree, in a democratic world religion is an option people can ignore and it will stay that way for a long time. Personally I want to see a Europe that is internally open but strongly controlled to the outside. And with a big refugee camp, somewhere.